Online education is quickly becoming a major phenomenon around the world, as we highlighted in a recent piece “Free online courses, recruitment and the university brand.” The ease and convenience it offers learners appeal to people just about everywhere, especially those who are trying to balance work, family, and other obligations with completing a degree or certification programme. Yet certain nations have embraced online education more than others, leading the way both in terms of the number and variety of programmes, and new innovations to online learning itself. Here, courtesy of Edudemic, we’ve highlighted some of the nations that are really stepping up the game when it comes to online education. Although other nations likely aren’t far behind, as illustrated by the graphic below which highlights the proliferation of high-speed Internet connections worldwide. The US is the undisputed leader in online education in the world today, with hundreds of online colleges and thousands of online courses available to students. A 2011 study by the Sloan Consortium found that 6 million students in the US are taking at least one online course, nearly one third of all those enrolled in higher education. In fact, enrollments in online courses are outpacing those of higher education as a whole, with a 10% increase in online students between 2010 and 2011 compared to a just 2% rise overall. In response, 65% of higher education institutions now say that online learning is a critical part of their long-term strategy. Of course, the US isn’t just the leader in terms of sheer numbers. It’s also been the model to follow in developing online delivery systems. Most prestigious universities in the US offer at least some courses online, and some have fully developed online degree programmes, even at the master’s and doctoral levels. Even more influential are US open educational programmes like those offered at MIT, which have been the international model to emulate. India is playing a major role in the growth of online learning opportunities that are popping up throughout Asia. Over the past few decades, India has developed numerous world-class universities and colleges which are fast becoming destinations for some of Asia’s best and brightest, and their online programmes are experiencing a similar boom. Part of the explosion of interest has stemmed from economic concerns, as many simply can’t afford to take two or more years off of work to attend a traditional college. Online schools help to solve that problem, and with programmes expecting to bring in a whopping US$1 billion in revenue by the end of the decade, it’s clear that distance learning has staying power in India. While home-based schools are doing well, including the popular IITs and private schools like Sikkm-Manipal University, American universities are also bringing online ed to India, offering courses at MIT, Carnegie Mellon and Cornell to Indian students. Currently, China is home to almost 70 different online colleges, a number that will likely grow in the coming years in order to meet the high demand for online learning opportunities. China has a long history of distance education, beginning in the 1960s with courses that were delivered via radio and television, but the nation is fast becoming a leader in online education as well. While problems with internet access in rural areas and a proliferation of diploma mills have slowed progress being made in China, several major online education companies are seeing rapid growth, due largely to the increased demand for highly trained members of the global workforce coming from China. The online learning industry is expected to grow by leaps and bounds over the next few years, and with steady growth since 2006, it’s looking to meet all expectations. When it comes to advancements in e-learning in Asian nations, South Korea is leading the pack, spurred on by the nation’s strong and growing high-tech industry and widespread high-speed internet access. In recent years, a number of universities in South Korea have begun offering online courses, and the country currently has 17 online colleges, all of which boast state-of-the-art facilities and software. Yet there have been some roadblocks to the success of online education in South Korea, largely stemming from the stigma online education still holds in South Korean society, where face-to-face education is highly valued. That may not stand in the way of development in this nation’s online education programmes, however, as it plans to use its resources to not only teach Korean students, but those in other countries around the world, offering more courses in English and promoting their ability to deliver what they’re calling “smart learning.” They’re also working to encourage more Korean students to enroll, pairing online courses with non-virtual activities on campus or in social settings. Time will tell whether or not the investment pays off for this tech-focused nation. Malaysia may not be the first place that comes to mind when you think of online education, but the small Asian nation is forging ahead at full speed when it comes to opening up new opportunities for learning online. One of the nation’s biggest e-learning schools is Asia e University, based out of Kuala Lumpur. It has been a boon for people in under-served areas, many of which have abundant access to the Internet but not universities or higher level degree programmes. And Asia e University doesn’t just reach Malaysians; it offers education to 31 different Asian nations and has partnered with an impressive number of schools to deliver blended and fully online programmes, even developing an MBA programme through the International Business School of Scandinavia in Denmark. While online education in Malaysia and Asia as a whole still has a long way to go, it’s clear that the country is going to be making waves in distance education for some time to come. Online education in the UK has been around for quite some time, but it was only in 2011 that it started to see a real boost in interest. The government’s Online Learning Task Force recommended an investment of £100 million in online education in order to help the nation build its brand, develop better online educational resources, and become a major international player in the distance learning market. The funding recommendation is partly in response to increasing tuition costs in the UK, much of which used to be covered by the government but now is turning students away from higher education. The government hopes that more convenient and cheaper educational options will stem that trend. Currently, a few private, for-profit providers and the Open University are leading the charge in online education, but new funding could make public programmes more successful and accessible to students. Distance education has become an increasingly popular option for Australians who want to head back to school without putting careers on hold, growth that was driven up even more by the economic downturn in 2008 and 2009. Over the past five years, the online education market in Australia has grown by almost 20% and is expected to be worth an estimated US$4.68 billion this year. Currently, the major players in the Australian market are Kaplan, Seek Learning, and Open Universities Australia, though many smaller schools are also bringing in a fair amount of students as well. Even more growth is projected in online programmes based in Australia that teach students from Asia, with the international market expected to grow to millions of students during the next 10 years, which if it comes to fruition will make Australia one of the world’s leading providers of online education. South Africa is one nation that has begun to capitalise on all the benefits that digital education can offer. They’ve developed nationwide online resources like EduNet and Thutong and offer online courses at both the high school and college levels through institutions all over the country. In the past few years, the online higher education sector in South Africa has seen steady growth, but the demand for highly qualified teachers, which the country sorely needs, may drive online programmes in teacher training much faster than other sectors. Currently, online education is still in its infancy in South Africa, but the government has demonstrated a dedication to improving and expending distance learning opportunities and programmes like GetSmarter and UNISA Online are showing that these goals are viable in the current marketplace. And finally, more to keep on your radar – the graphic below highlights the proliferation of high-speed Internet connections in ten countries, which represent nearly 67% of the global total unique IP addresses. 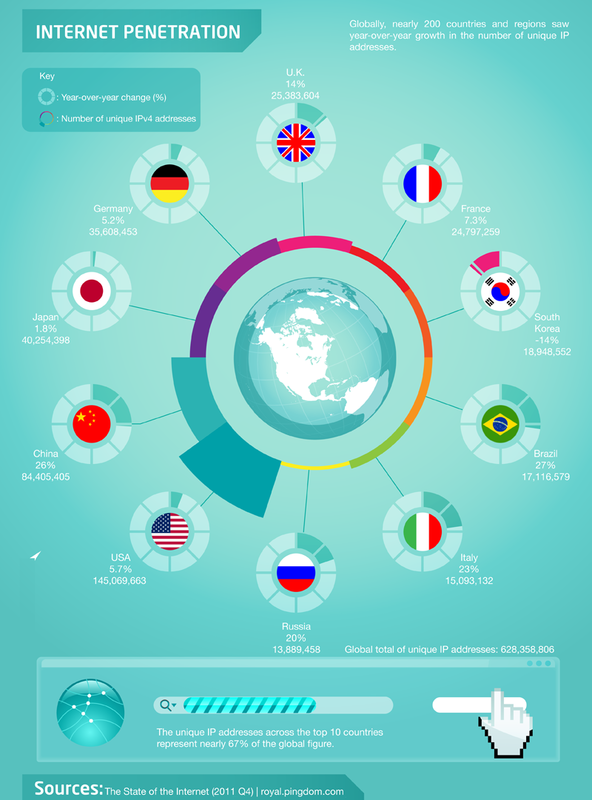 This entry was posted in Africa, Asia, Australia, Australia/Oceania, China, Europe, India, Malaysia, Most Popular, North America, Online Learning, Regions, South Africa, South Korea, Technology, United Kingdom, United States and tagged distance learning, infographic, Most Popular, STEM degree, Trend Alert. E-learning is here to stay in India. Pingback: Glow and CfE support – the elephant in the room?